The 605619 Movado Fiero Men’s Watch utilizes a slick and sporty design that favors simplicity while maintaining a classy and formal quality. The 605619 Fiero features a round, 34mm tungsten carbide case and band, black museum dial and Swiss Quartz movement. While it retains a humble and conservative stylistic quality through its simple, horizontal chain design, the 605619 Movado Fiero Men’s Watch stands out in the high quality of its material build of tungsten carbide. The simplicity of the wide horizontal chain design also adds a hint of rugged sportiness to the appearance of the 605619 Fiero, making it as compatible for casual wear as it is for the most formal of settings. The 605619 Movado Fiero Men’s Watch comes built with a 34mm tungsten carbide case and screwed down case back, scratch-resistant sapphire crystal and a push-in crown with a water resistance of up to 30 meters. The sizeable bracelet band measures 20.3cm and is built with tungsten carbide with a high-polished finish. The 605619 Fiero uses a push button deployment function in a hidden folding clasp, and operates with hand movement powered by Swiss Quartz battery. 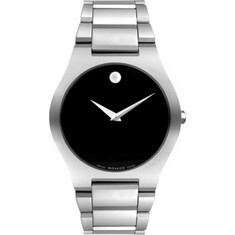 The 605619 Movado Fiero Men’s Watch retails at an MSRP of $2995.00 and comes with a Two-Year Manufacturer’s Warranty at purchase.